Capable of lifting up to 4,000 lbs. of 48″ x 96″ materials up to a height of 200″, transport it to the desired slot, and then unload it into the live storage rack. It can retrieve one or more sheets or the whole stack, lower it, and deliver it to a designated drop-off area. Safe & smooth loading and unloading. Pantographic design for uniform lifting. 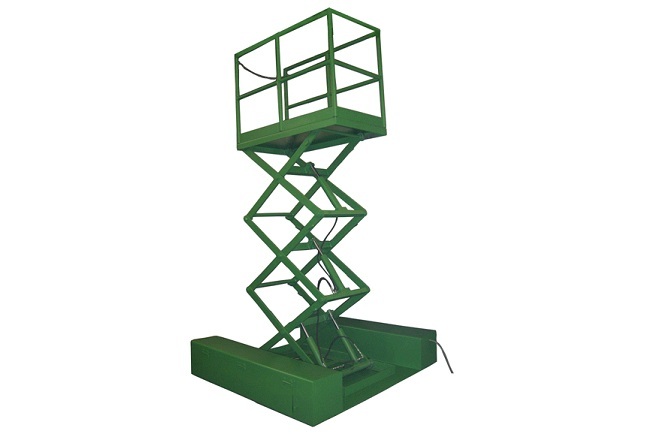 The top is equipped with a power roller conveyor for loading and unloading. 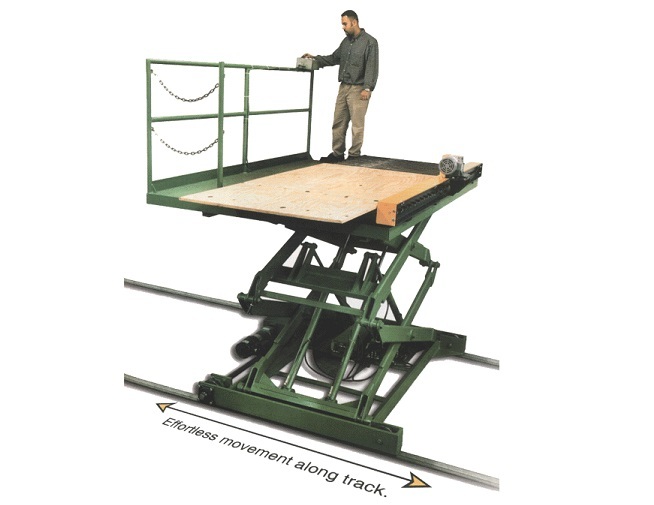 Next to the conveyor is a 30″ wide skid-proof catwalk for the operator equipped with a 42″ high safety railing with kickboard. Variable speed for ultimate control. Able to travel laterally along an inverted angle iron guide on V-groove wheels that are electro-mechanically driven. Variable speed propulsion guarantees smooth acceleration and deceleration. The controls can be located at either end of the safety railing on the operator’s deck. The Husky-Master is the most versatile and configurable shop crane, floor crane, portable crane in the industry! Powered cylinder lift optional Electric (either battery or 110 volt AC) and air power cylinder lift are available. Powered telescopic boom provides maximum versatility Counterweight required for maximum extended boom capacity. 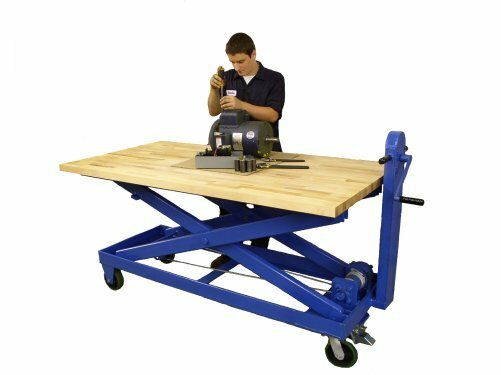 TI’s new Low Profile Zero-Low Lift Table brings load even closer to the operator to save time, improve safety, reduce worker fatigue, boost morale–all providing increased productivity and profits! Travel as slow as one fpm (up to 4 mph) for precise positioning or manuevering in tight spaces or around expensive equipment. Turn on a dime to travel in any direction desired without having to back in and out or compensate for a wide turning radius. All power components are neatly hidden away in the fenders, yet are still easily accessible via hinged access panels. Low maintenance! Keep the batteries charged and go to work without having to worry about constant maintenance and repairs. Large diameter polyurethane coated wheels and dual swivel casters with pivoted steering handle makes positioning quick, easy and accurate. The heavy-duty hydraulic lifting cylinder on a standard Super-Master is hand-pump operated. Optional battery or 110 volt AC power is available.